Niacin is the third vitamin in the B-complex and is also known as B-3. Niacin binds to, and flips the “on-switch” on, G-proteins, which aid in smell, behavior and mood regulation, immune and nervous system, and more. Niacin blocks the breakdown of fats, and, therefore, helps decrease the “bad” cholesterol that the liver secretes, which also increases the “good” cholesterol! That being said, Niacin is great for your cholesterol levels, your heart, and your body in general. Niacin is one of the vitamins that produce symptoms even when the deficiency is only mild. The symptoms of a mild deficiency are: indigestion, fatigue, depression, vomiting, and canker sores. How Does One Get Deficient? Niacin deficiency can usually be seen in countries where malnutrition, poverty, and chronic alcoholism is prevalent and in countries where corn, which is very low in Niacin, is the staple food. Many people in first world countries get enough through their diet, but it’s still seen in developed countries, since it’s most commonly caused by alcoholism. It can also be caused by health problems that hinder the body from absorbing Niacin and prolonged use of Isoniazid, or Laniazid or Nydrazid, which is used for Tuberculosis. What Happens if I am Deficient? If symptoms of a mild Niacin deficiency are ignored, the deficiency can get severe, which is called Pellagra. Thus, Pellagra affects the skin and the digestive and nervous systems. It’s very symptomatic. Some of the heath issues from Pellagra include: dermatitis, fatigue, depression, swollen mouth and red tongue, aggression, apathy, memory loss, disorientation, dementia, vomiting and diarrhea, Insomnia, paralysis, and headache. Left untreated, Pellagra will lead to death within four years. Unless you have underlying problems causing your deficiency, a diet rich in foods that contain Niacin may help, as well as prevent a Niacin deficiency in the first place. 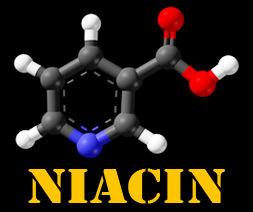 Foods rich in Niacin include: liver, avocados, tomatoes, carrots, red meat, eggs, fish, broccoli, tomatoes, leafy vegetables, dates, enriched pasta, legumes, sweet potatoes, asparagus, fortified cereals and breads, poultry, soy sauce, mushrooms, yeast, and peanuts. A good vitamin, like Time Release Niacin, Niacin Intensive, or Flush Free Niacin, will do the job. If you’re experiencing any of the symptoms above, you should consider taking a B-3 vitamin. Most multivitamins and even B-complexes do not contain enough B-3 to care properly for your health, so adding B-3 to your daily vitamin list is important. If you’re wondering whether you should take Niacin or not, think about this: 1 in 3 people die from heart disease, and depression is an epidemic, affecting 1 in 10 adults. This entry was posted in Health & Wellness, Home. Bookmark the permalink.